I love to listen to nonfiction too. I've got Grocery in print and need to get to it. Kathy - I think you'll enjoy Grocery. I'm sure it's just as good in print. Discovered some great audio for my TBR...Nothing to Envy and My Life in Middlemarch. Many thanks! Nancy - Nothing to Envy seems especially timely even though it's nearly a decade old. I need to read more about North Korea. I often say that I have a goal of fifty percent non fiction but I think that I reading closer to thirty percent. Books on the food industry can be so enlightening. The books that you did read sound very good. Brian Joseph - I think about a 50% nonfiction goal, but am not sure I'll ever get there. This year's 40% is the highest yet. 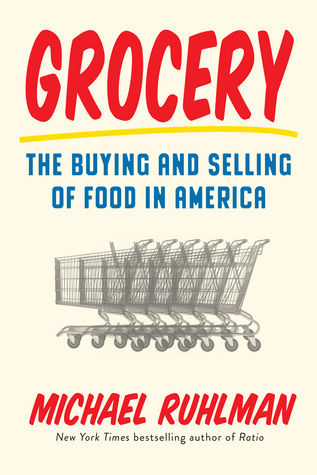 I've already added a couple more food industry books to my list this week! 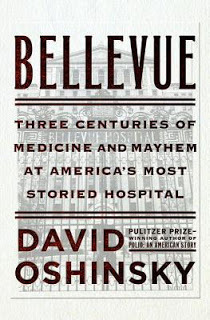 Bellevue sounds so interesting to me because I tend to love that medical/history combination, too. I'm just not sure I could take the denseness of it right now. Susie - I really enjoyed Bellevue but hesitate to recommend it... the medicine/history subject is definitely a niche area, plus the denseness may turn some people off. I thought it was fascinating though. Kazen - Beware! 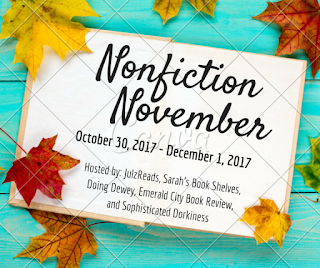 Nonfiction November will cause your tbr list to explode. All of the excellent recommendations will keep you reading for an entire year. Hope you get a chance to try Grocery or Nothing to Envy. Grocery sounds fascinating! The Dear Man and I do "grocery story tourism" when we travel, so I think this book might have been written expressly for us. I love the idea of Nonfiction November, but I never seem to follow through. I'm still reading Travels With Charley, but left it in the trailer, so I won't get back to it until the 12th when we head out on another camping trip. I'm reading magazines and blog posts for the time being, but will probably get back into The House at Tynford, so not much nonfiction for this year's event. Have fun! Les - I think Travels with Charley is a book best enjoyed on the road. If I can talk hubby into it, I'd love to listen on our drive to Florida. I'll bet it's a great audiobook! You'll have to let me know, in case I ever decide to "read" it a third time! Les - I've already listened once and the audio is wonderful! Feels like Steinbeck is talking to you. Like you. I love all the temptation that happens that happens via this challenge. Brona - My foodie wish list is already exploding and we're only 2 days into Nonfiction November! LOL, I think North Korea and Middlemarch are about as far apart as you can get on the nonfiction spectrum... goes to show how diverse our interests can be! Most of my audio books are nonfiction too. I feel like I follow them better than fiction. I;ve added grocery to my tbr. I run a monthly link up for foodie books so that would fit in well. Heather - For whatever reason, my mind wander less when I'm listening - maybe we are both auditory learners? I'll have to check out your monthly foodie book link... can't get enough of them! Oooh - I love Ruhlman and haven't read that one yet! Adding it to the list. Sarah - I'd definitely be interested in reading Ruhlman's other books. Any in particular you'd recommend? Sorry to hear about My Life with Bob... the first half of the book was definitely better. I was curious to know what kind of path got her to NYTime book review. Oh my god, I want to read everything you have just listed out. :) Uhooooh. My Life With Bob particularly struck a chord, though the food-focused books also sound fascinating. Dammit they all sound fascinating! Awesome. Nikki - You have just discovered the perils of Nonfiction November.... you'll get book recommendations to last an entire year! 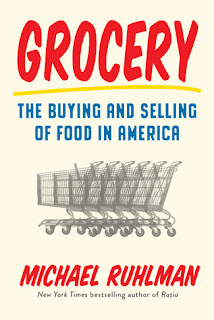 Definitely adding Grocery to my TBR - sounds like a good read on something I don't normally think about outside of my weekly trip! Angela - I'm a huge Wegmans fan and Grocery focuses on Heinan's, a Cleveland-based chain than seems similar, but on a smaller scale. A fascinating read! I like to listen to non-fiction as well--not exclusively but it really lends itself to audio. I've been saving some non-fiction for November, and I really should add the Middlemarch book to my list as I am a big fan of the novel. JaneGS - I think you would be the perfect reader for My Life in Middlemarch! Grocery sounds fascinating, I'm definitely going to check it out. Thanks for the tip! Nick - I'll admit to being a foodie, but I have always been interested in the inner workings of a grocery store. It was a great read! Good luck with Nonfiction November! I love nonfiction and read a lot of it. Bellevue is actually on my TBR list, so I’m glad you liked it. AJ Sterkel - Bellevue was such an interesting read!It did get a little dense at time,s, but there was just so much fascinating history... definitely worth wading though! Hi, JoAnn! All of your books look interesting. Nothing to Envy looks fascinating. I'm adding that and My Life in Middlemarch to my list. 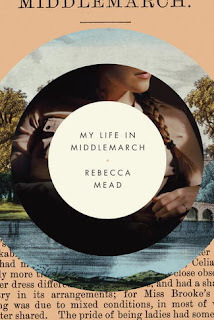 Monica - My Life in Middlemarch was the perfect blend of memoir, literary biography, and literary criticism... hope you love it, too! I like nonfiction quite a bit -- but I find it usually takes longer to read, eh? So many facts at times. I hope to read at least 1 nonfiction book in Nov. but I will tune in to the posts by you all on your nonfiction books. thanks. Susan - I seem to be bogged down with fiction at the moment. Beginning week 3 with A Gentleman in Moscow - so well written and elegant, yet so slow. Hope to finish this week and move on to nonfiction. Hopefully something quicker ;-) Good luck fitting in some nonfiction in November! I am *definitely* a sucker for history and medicine, JoAnn; the book on Bellevue sounds right up my alley! I'm currently reading The Immortal Life of Henrietta Lacks and loving it. Tara - History and medicine gets me nearly every time. I loved The Immortal Life of Henrietta Lacks, too. I learned a lot from Tomatoland. I'm so excited to see what everyone is going to be reading during this month. I don't read a lot of nonfiction so I'm hoping this will be the nudge I need to pick up some new reads. 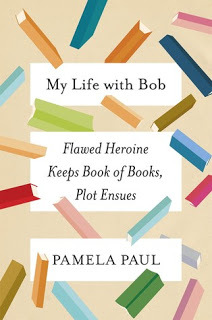 I'm adding the Pamela Paul to my list - sounds like a great read! Hope you find some great reads this month, JoAnn! Iliana - I think I'm getting burned out with contemporary fiction... classics and nonfiction have been calling lately. Looking forward to all the great suggestions this month. Your non fiction choices are always unique. I can’t say that I want to read more nonfiction...but I probably should! Patty - No "shoulds" allowed... read whatever appeals to you, whenever you feel like it!! Buried In Print - Yes, I thought Salt Sugar Fat was excellent! I listened to it several years ago and was riveted, though parts of it made me furious. There have been several food book suggestions in the week's NF November posts...I've already added 2 or 3 to my wish list already. 40% nonfiction is pretty impressive! I don't read nearly so much. I'm guessing I'm more 15-20% nonfiction. Kim - I read 10-15% nonfiction for years, then over the past 5 or 6 years the percentage began to gradually rise. That might coincide with my discovery of nonfiction on audio. More recently I began to notice that nonfiction seemed to pull me out of reading slumps, too. I'm not a focused non-fiction reader, and yet when certain books come up on my radar I wind up loving them. I enjoyed Bellevue also. Thanks for sharing your favorites. Anita - That's how I was, too... always a pleasant surprise when I found a nonfiction book I loved. It's only been in the last 4 or 5 years that I seek out new nonfiction titles. 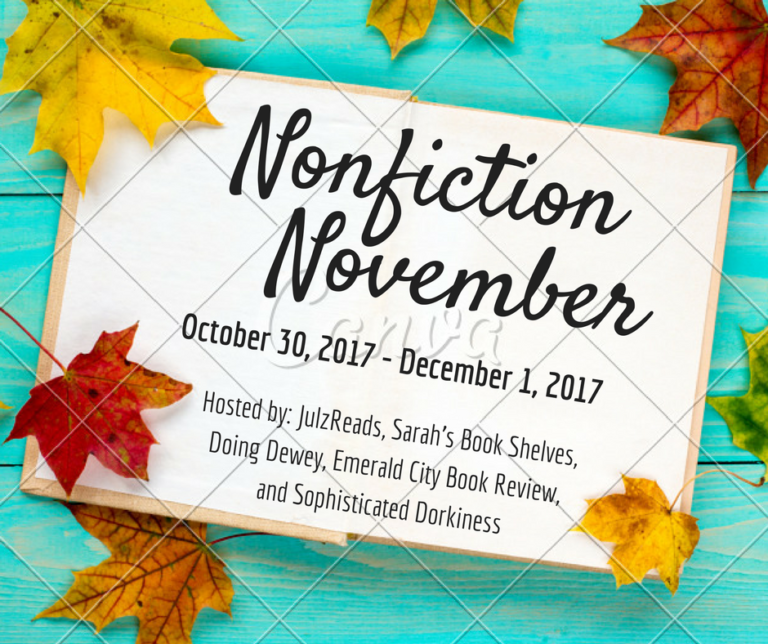 Tina - So glad you're going to join in for Nonfiction November! Be prepared though, your TBR list is going to explode. 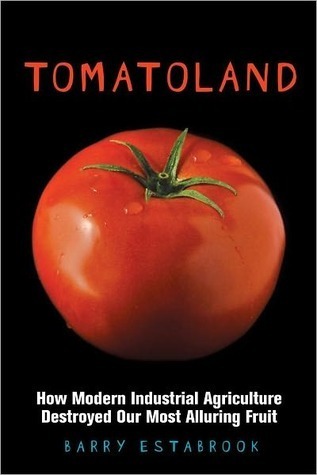 I really enjoyed Tomatoland... had been trying to figure out why it is so hard to get good tomatoes in Florida! Nothing to Envy looks really good as does My Life with Bob. I really love non-fiction but in the last year or two it's probably been one of my most neglected genres. Look forward to seeing what you read! Katherine - I've spent a lot more time with nonfiction in the last couple of years... ever since I discovered it was the perfect cure for my more frequent reading slumps. I have Grocery but haven't read it yet, I need to get on that! Kim - Grocery was excellent. I need to check out Ruhlman's other books. Nothing to Envy was a shocker of a book for me. It's a must read for everyone, I think. Bob was a nice little book-about-books book. I can't get enough of these. I've heard Grocery and Tomatoland are both excellent! Nice list! Thanks, Heather, they are both perfect books for foodies. Happy reading this month. I'm glad you liked My Life in MM -- I loved it when I read it a few years ago but some other readers have been lukewarm. I want to read Nothing to Envy but I'm scared of anything about N. Korea. Must get over that. Lory - My Life in Middlemarch probably appeals to a narrow segment readers, but it was perfect for me. 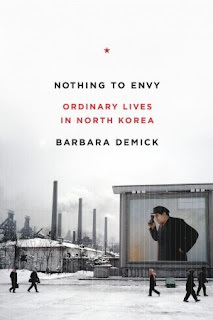 Nothing to Envy was a good introduction to life in North Korea. I learned a lot and am looking for other titles to add to my list. Jessica - Nonfiction and classics seems to be where my reading taste is heading. Emma - Hope you enjoy it as much as I did! You've had a great year in nonfiction. There's always so much to read. Thanks, Louise. Isn't that the truth?! I love books about books! I even have a little section of it in my book collection. Obviously I'm adding My Life with Bob to my TBR RIGHT. NOW. Nothing to Envy sounds like an absolutely fascinating book. Think I will have to look it up. Louloureads - Nothing to Envy is excellent! I need to find more books about North Korea. Tomatoland is going on the tbr for this girl who would build a greenhouse and grow my own tomatoes year round if I could! Lisa - I'm right there with you! Tomatoland is going on my list immediately! Makes me think of Banana: The Fate of the Fruit that Changed the World - which was fascinating. I am definitely going to have to look for Bellvue as well. Great list! Amanda - Now I have to go look up Banana...sounds like my kind of book! Katie - This has been a great year for reading nonfiction... pretty sure it's a record for me percentage-wise. I think some of the mixed reviews of My Life with Bob come from disappointment at not seeing any of the actual entries in her Book of Books. She talks about books she was reading at various times in her life, but there wasn't much specific information/reflection on the books themselves. She primarily used the books to frame her life story.